I was supposed to go on a skiing trip this weekend but apparently, 20 feet of snow is not as awesome as it sounds. Closed roads, weather advisories, and news generally telling people to postpone trips all add up to one thing: No skiing. But at least I get to sleep in. Another thing I get to do is read! Since my Amazon order was slow to ship, I picked up a book I’ve had on my bookshelves since last October. I didn’t give it much thought at first, figuring druggies and gangs aren’t really my thing. But I’d promised a friend I would pick it up and in the absence of something else, I did. Very carefully, because my copy is autographed and I didn’t want to ruin it. The story centers around Chess Putnam, a Debunker for the Church of Truth. Her job is to investigate reports of hauntings and find out if they’re real or fake. Only problem is, she has a slight drug addiction and her supplier decided to use her debt to him to make her get rid of some ghosts “unofficially.” Still, that would be fine, if his rival hadn’t caught wind of it. He wants her to not do that. What’s a girl to do? There’s an element of romance in this, complex just like all the characters in this book lol but don’t mistake it for a romance book – it’s not. The story is amazing, though and I highly recommend it. 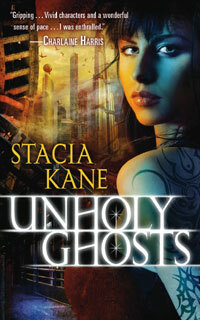 You can read more about this series at Stacia Kane’s website. =) check her out!